Katie O'Reilly grew up on the Main Line and worked in marketing in New York before coming home to Philly and the Sixers. The Sixers are leading the way in the NBA when it comes to putting women in charge. Meet Katie O’Reilly, the Sixers’ chief marketing officer, and read our other profiles here. It’s 6:31. Arnie’s late. So is Ed. Katie O’Reilly sits in the second row of seats at the Wells Fargo Center, where members of her Circle of Stars will soon perch in 90 minutes, when the Sixers play the Bucks. She fidgets with her phone. O’Reilly is the team’s chief marketing officer, the woman who sells the Sixers, a commander in the legion of Sixers female executives. She’s in charge of slogans and catchphrases and making the brand cool again, and she’s already had a long day, and it’s going to get longer. But 6:30 is reserved for Arnie and Ed. You see, Arnie is 7 months old. Ed is his father, O’Reilly’s husband of three years. The family FaceTimes at 6:30 on game nights. A former point guard at the Shipley School in Bryn Mawr, O’Reilly took a while to come home. 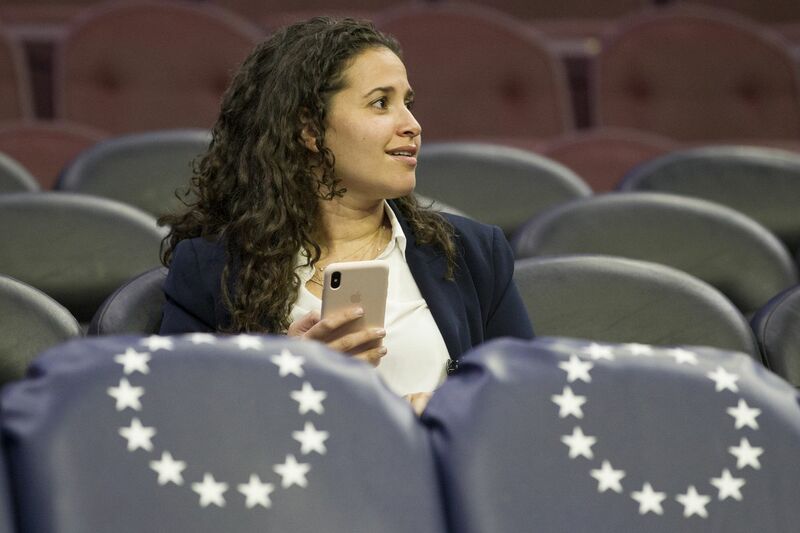 She graduated from Michigan in 2007, got a job selling tickets for the Knicks and Rangers, then moved on to the NBA office as a marketing coordinator, where she met future Sixers CEO Scott O’Neil and future Sixers president Chris Heck. She spent three years with New York marketing firms, then got a call from O’Neil in the summer of 2013. He had started with the Sixers in July. Heck started in August. It was September. She came home. She uses every tool available. You know those pro-Sixers tweets Joel Embiid and Ben Simmons post? O’Reilly has a hand in those. As a kid, she cheered for Allen Iverson on the court; now, as the director of business development, she gets Iverson courtside seats. Four promotions later, she does the same for Eagles stars Carson Wentz and Alshon Jeffrey. Phillies sluggers Bryce Harper and Rhys Hoskins prefer seats in suites? No problem. Meek Mill always goes in the front row. She spent five years courting Philadelphia’s glitterati, and branded them the “Circle of Stars,” and they mentioned the Sixers on Twitter and Instagram. Now, the Sixers have maxed out at 14,500 season tickets, and everyone wants to ring the bell before games and make the projected court collapse. Katie O'Reilly helps orchestrate events like the pregame bell ringing with Bryce Harper. “We want everyone to have a Sixers car flag." Preferably, one with the #PhilaUnite playoff slogan and segmented snake logo they used last year, and this -- another O’Reilly idea, borrowed from Ben Franklin’s “Join Or Die” cartoon from 1754. She was history major, after all. But all of that becomes background noise when she hears that bubbly FaceTime ring, which now is two minutes late. Of the nine prominent Sixers women we have profiled, only O’Reilly, 34, and human resources vice president Tyneeha Rivers have children. Rivers’ son, Mikal Bridges, starred at Villanova and was a rookie in Phoenix this season. Annelie Schmittel, who has been married for four years, has carefully considered the question of parenthood. “I’m one of the very few people in my circle of friends that doesn’t have children. That’s by design, because I knew exactly what I wanted to do," Schmittel said. Lara Price, chief operating officer, knows the Sixers will support any women who chooses to have children. So yes, O’Reilly might miss an occasional meeting, but she misses a lot more of Arnie’s life. Ed works, too. They have a nanny. But nobody replaces Mommy. “My thing is, when I’m there, I’m present.” O’Reilly said. Her phone bubbles. Her face lights up. She raises a finger and turns away. It’s 6:33.